In the reference 3rd read above, the State Project Director, SSA, Andhra Pradesh has submitted a proposal for providing necessary infrastructure viz..., Furniture, Compound Walls & Bio-Fencing and Addl. 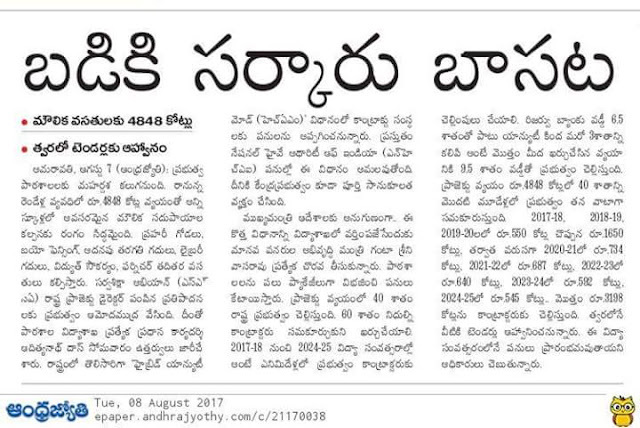 Class Rooms including Library Rooms, Water & Electrical facilities in all Govt Schools with an estimated cost of Rs.484800.00 Lakhs (estimated cost + interest) on HYBRID ANNUITY MODE (HAM). It is proposed to invite for Request For Proposal /Tender calling for experienced and competent companies that can complete the works within 24 months in all Govt Schools of Andhra Pradesh. This is expected to ensure with good infrastructure, good environment and quality education for the students in all Government Schools. The said amount of Rs.484800.00 lakhs is proposed to be met from the School Education budget by making a provision in the Budget Estimates from the year 2017-18 to 2024-25.
a. The Request for Proposal (RFP) for the project on design, build, operate and transfer (“Hybrid Annuity Mode”) basis, and to carry out the bidding process for selection of a private entity as the Bidder to whom the Project may be awarded on e-procurement portal of Government of Andhra Pradesh i.e. www.apeprocurement.gov.in. b. The Concessionaire shall, at its own cost and expense, procure finance for and undertake the design, engineering, procurement, construction, operation and maintenance of the Project and observe, fulfil, comply with and perform all its obligations set out. c. The Concessionaire shall comply with all Applicable Laws and Applicable Permits (including renewals as required) in the performance of its obligations. d. During the Development Period, the Concessionaire shall maintain the existing Project, in such a manner so as to ensure that the Infrastructure is in good condition and also to ensure that the quality of service and safety are maintained and in the event of any material deterioration or damage other than normal wear and tear, the Concessionaire shall undertake repair thereof. The Concessionaire would be reimbursed the cost of maintenance only if it maintains the Project. e. Upon request made by the Concessionaire to this effect, the Authority shall, in conformity with any regulations or guidelines that may be notified by the Government or the Reserve Bank of India, as the case may be, permit and enable the Concessionaire to secure refinancing on such terms as may be agreed upon between the Concessionaire and the entity providing such refinancing; provided, however, that the refinancing hereunder shall always be subject to the prior consent of the Authority, which consent shall not be unreasonably withheld. The Authority shall endeavour to convey its decision on such request of the Concessionaire within 30 days of receipt of the proposal by the Authority. f. If the Concessionaire does not achieve any of the Project Milestones or the Independent Engineer shall have reasonably determined that the rate of progress of Construction Works is such that the Project is not likely to be completed by the Scheduled Completion Date, it shall notify the Concessionaire to this effect, and the Concessionaire shall, within 15 (fifteen) days of such notice, by a communication inform the Independent Engineer in reasonable detail about the steps it proposes to take to expedite progress and the period within which it shall achieve completion. g. To complete all the works as per scheduled time scale, penalties will be imposed if they fail to reach mile stones laid down in MOU for lapses. h. To construct quality works under Independent Engineer and our own quality control wing and which will issue final completion certificate of quality. i. To maintain and repair the works till liability period expires i.e., 5 years. k. Sufficient technical staff should be appointed as per the Government norms for effective supervision of the works. In the circumstances stated by the State Project Director, SSA, Andhra Pradesh in the reference 3rd read above, after careful examination of the matter, Government hereby accept the proposal of the State Project Director, SSA, A.P. Amaravati and accordingly, hereby accord administrative approval for the works for providing necessary infrastructure viz.. Furniture, Compound Walls & Bio-Fencing and Addl. Class Rooms including Library Rooms, Water & Electrical facilities in all Govt Schools with an estimated cost of Rs.484800.00 Lakhs (estimated cost + GST + interest) on HYBRID ANNUITY MODE (HAM) by calling for Request For Proposal/Tender with suitable Special Conditions of Contract and General Conditions of Contract in as many packages as required and to complete the works within 24 months in order to equip all schools in the State with good infrastructure, good environment, sufficient and quality and ergonomically suitable furniture for students with storage facility for books/note books and creating most suitable enabling environment for providing quality education to the students. The cost of the project would be met from the School Education budget by making a provision in the Budget Estimates from the year 2017-18 to 2024-25. The expenditure shall be chargeable to the Head of Account 2202 – General Education, 01- Elementary Education, 001 – Direction and Administration, 06 – State Development Schemes, 05 – Sarva Shiksha Abhiyan (SSA), 310 Grants-in-Aid, 312 - Other Grants-in-Aid. The State Project Director, SSA, A.P. and the Commissioner of School Education, A.P. shall take further necessary action accordingly. This order issues with the concurrence of the Finance (FMU-Edn) Dept vide their U.O. No.41022/115/2016, dated:12.07.2017.